Crude oil, which in essence is unrefined petroleum, is usually traded in futures. This can be done at the NYMEX (New York Mercantile Exchange) and the TOCOM (Tokyo Commodity Exchange). Most binary options brokers will allow Crude Oil trading on their platforms. Simply put, online Crude Oil trading is the second most popular after gold trading. 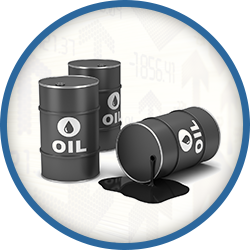 Crude Oil trading is extremely popular because of the fact that this is one of the most valued commodities in today’s world. Fuels which are obtained from crude oil are used for cooking, and different modes of transport, including aviation. In order to know how to trade crude oil efficiently, one must examine the factors which influence the prices of this commodity, and by consequence crude oil trading. This includes inventory reports, the OPEC quota, and weather patterns. The inventory reports are released once a week and include information concerning the number of crude oil barrels which are in storage, reflecting the amount of supply that is available. This report, however, does not directly influence live rates or online crude oil trading activities. The OPEC quota reflects the quota given by its member countries, essentially deciding the supply and prices. The way in which the weather affects this commodity is that if there are extremely cold winters, then this means that this commodity’s by-product, heating oil, is in high demand. Through this page, you will be able to consult a chart in order to gather as much information for how to trade crude oil efficiently.